Hey stranger, I missed you! Writing about all the book projects (and reading all your lovely comments) has been great fun, but I’ve missed just chatting with you. I like telling you guys what’s going on around here. Though to be frank, what’s been going on so far this week is probably less than fascinating blog fodder. I’ve been putting books in envelopes. I’ve been putting lots of books in envelopes and then putting them out for the postman. That’s pretty much all I’ve been doing. 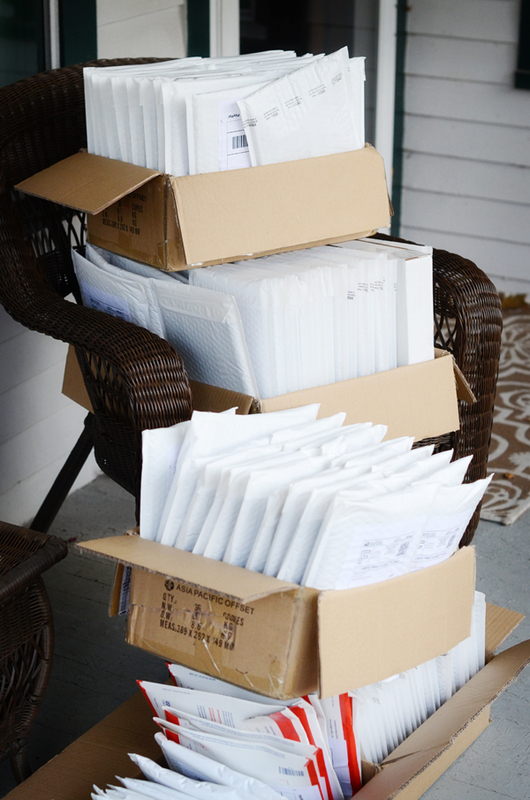 The first batch went out Saturday (I figured no one would mind if they came a bit early), another went out Monday, and another today. More will go out tomorrow. The front porch looks like this. Now I am going to take Thanksgiving through the weekend off (we will, of course, be having the traditional Thanksgiving Pizza). The mail won’t move on Thanksgiving anyways, and I need a few days without packing labels and envelope adhesive to maintain my sanity. But things will pick back up next week and the shipping parade will continue. I’ll keep you all updated as it goes forward, but my general plan is to put out a few hundred books a day, so we should be through them pretty quickly. I want to see them on your needles almost as badly as you do! We are forgoing the traditional Thanksgiving lasagne in favor of dinner out with my mother on Friday. I will still owe the eldest a birthday dinner (her birthday was yesterday), but at 21, she is willing to delay it. My copy of the book arrived yesterday. It’s pretty! The hardest part, I think, will be deciding which one to do first. I may not start until next week, because it’ll take that long to decide…. Yay!! Can’t wait til mine arrives! I can’t wait for my book to arrive. I may have to cast on a curl over the Thanksgiving weekend. You deserve a break! Funny how the mundane is always such a big part of the exciting! Have a great Thanksgiving. Really looking forward to my copy of the book! Yaay! I’m sure your mail carrier is less enthused, but I am totally excited to see the book in person when it arrives! Have a great Thanksgiving! My book arrived! Drat the holiday knitting that must take precedence and the UFO sweater that I promised would become an FO before I cast on anything new. I got the e-mail that my package had been shipped this morning! So excited to get my book! I just received my copy of the book and my wonderful little bag of treats. Thank you! The book is so lovely — cannot decide what to make first. Thanks as well for the great little treats — what a nice surprise! Not surprised this is a best seller. Awaiting for my copy, but I did order the ebook as well so I could get started on these beautiful patterns. But there truly is nothing better than a book to browse through. I guess mine is one in customs so I will wait patiently.